New Apartment in Playa Honda, next to the Deiland Shopping Center. It has 3 bedrooms, 2 bathrooms, living room, kitchen and terrace. The master bedroom accommodates a bed of 135cm and has the bathroom en suite. The second bedroom has two 90cm beds and in the third there is a 90cm bed. Both bathrooms have a bathtub. The kitchen is very well equipped, has microwave, dishwasher, toaster, kettle, coffee maker and any utensils you may need to make your favorite food. The living room has a dining table and a sofa in front of the convertible TV in bed. On the large terrace you can see the sea, and also find the area of ​​the washing machine with a place to hang clothes. Safe. It is located 5 minutes from the beach and the extensive and beautiful promenade of Playa Honda, and 1 minute from the Deiland shopping center, where you can buy, go to the movies, restaurants, cafes ... and enjoy the best center commercial of Lanzarote. Towels, sheets, soap, toilet paper and cleaning products are provided. Security deposit of 150eur, to be returned upon departure, once checked the apartment. Minimum stay of 5 days. Trustful person. Perfectionist and responsable. Next to the shopping center where to do shopping, having a meal, cinema, bowling, pharmacy… And located in Playa Honda, residencial town with fabulous promenade and white sand beaches, and situated in the center of the island. Sea views, huge lounge terrace with sunbeds and umbrella where having a nice relaxing sunbath or a bottle of wine on the sofas. We have just returned from our holiday at this lovely apartment in Playa Honda. Emilio updated us once we arrived at the airport and was at the apartment when we arrived by taxi. The apartment has three bedrooms and two bathrooms, one en-suite. It has a very large balcony with sunshine all day. The apartment is close to the supermarket and also close to some lovely restaurants at the sea front. 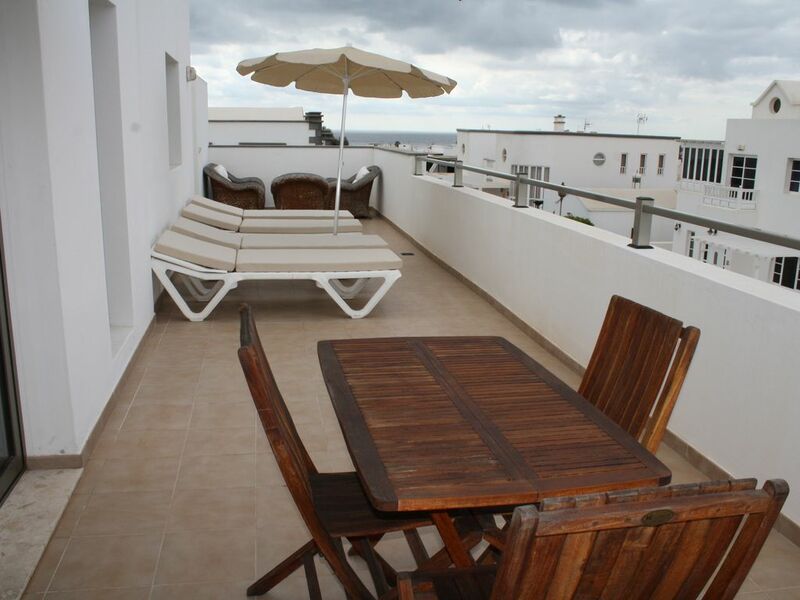 It is also very convenient for walking to Arrecife and Puerto del Carmen. The bus stop No 3 and No 21 are close by. We really enjoyed our time here and hopefully will return next year. Thanks Emilio for making our stay stress free. Thank you so much for your wonderful review. I am very glad the apartment achived your expectations. Thank you for leaving the house even better than before. To be honest, it was not a surprise, you look and you are a lovely couple. And thank you for coming and thinking about booking again. Sadly we had illness during our stay, all down to us and in the circumstances Emilio was a tower of strength with total help whenever we needed it. The apartment was ideally located and could not be faulted for size and comfort, definitely recommended and very good value for money. I am very sorry for the current circumstances. Hope it goes better than expected. Anyway I feel lucky to meet you, and grateful for being useful for you. I will keep you in my heart. Had fantastic communication with Emilio, a very helpful non intrusive host. The apartment was spotless and in a excellent location. It’s a pleasure dealing with such a nice family. Looking forward to meeting you again. Take care! Spacious well appointed apartment in convenient location. We really liked this apartment. Three good sized bedrooms, two doubles and a single. Two bathrooms. Very well equipped kitchen and spacious living area leading out to a large south facing terrace which had great views but wasn't overlooked. Wonderful for sundowners! The apartment is situated in a residential area and is close to a popular shopping centre so no need for a car to do a supermarket shop. A five minute walk takes you to the seafront which has a wide traffic- free promenade perfect for walking or cycling. Head north to Arricife and Costa Teguise or south to Puerto del Carmen. Playa Honda is an attractive low rise residential area so there are no "tourist" shops but there's at least ten very nice restaurants and bars spread out along the seafront.This was my favourite part of the coastal bike ride. Returning to the apartment - apart from the the fact it was well equipped enough to live in all year round - the decor was far superior to most other properties I have rented. Finally I must mention Emilio who acted as property contact. He got in touch with us before we travelled to arrange to meet us at the property on our arrival. Once there he gave us a few essentials in a welcome pack including a very nice bottle of local wine! His English was excellent as was his local knowledge. He helped us arrange taxis, gave us useful tips about the area and information about amenities, restaurants and bike routes etc. An excellent local representative. The weather was also almost perfect and we very enjoyed our stay. You know it’s a pleasure for me to help people like you. A very nice and healthy family, that I hope to see again soon. Wonderful clean apartment well located to shops beach bars and restaurants... Emilio who met with us on our arrival was extremely helpful in showing how to operate dishwasher and washing machine, he kept in touch and was very helpful regarding some areas we wanted to visit. The kitchen was well equipped, the settee was very comfortable and the tv had a good selection of english channels if you wanted to view them. Beds were clean and very comfortable, with extra linens and towels supplied to change yourself. The large balcony had a lovely panaramatic view of Playa Honda and the sea, with the most comfortable sunloungers. Just downstairs was a lovely little coffee shop whiched served the best food, cake and tapas, you should absolutely visit Ku & KU Cafeteria Pasteleria the owners were so very friendly. A long and great description. I am so grateful to you. And very happy you enjoyed your stay, although I am sure you have fun wherever you go. Really nice people which I would like to see again soon. Thank you Freda. You are a lovely couple. It will be a pleasure having you back. Playa Honda hosts more than 10. 000 inhabitants, high demand by local people and provided with all kind of services. Located between Arrecife and Puerto del Carmen, in the middle of the island and close to the airport, it is a perfect point to stay. Its large promenade, wide sand beaches, local bars and restaurants with affordable prices and good quality food, make it the perfect town to live even for a short stay.